File under "I love fandom, reasons why." shinga made the *best* goddamn memorial to Steve Irwin. Found here. (Also, anyone who has ever played KOTOR will thrill to a Revan/Carth cartoon found therein.) 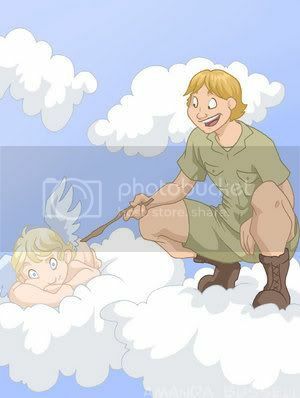 The artist notes this was inspired by a throwaway line on metaquotes: "Somewhere in heaven, a very groggy, very confused angel has just woken up and is trying to figure out why a boisterous Australian man is poking it with a stick." *adores* I just love his smile, and the angel's face.